Oh my gosh, it's the final day of the 5th Annual Handmade Holidays Blog Hop! 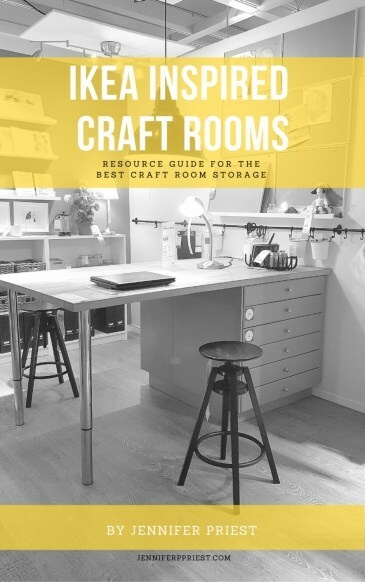 Every year for the last 5 years we have hosted a blog hop all about handmade gifts that you can make to save money, use your craft supplies, and create something meaningful this holiday season and beyond. I have people on my list who are HARD to buy for – they have everything! 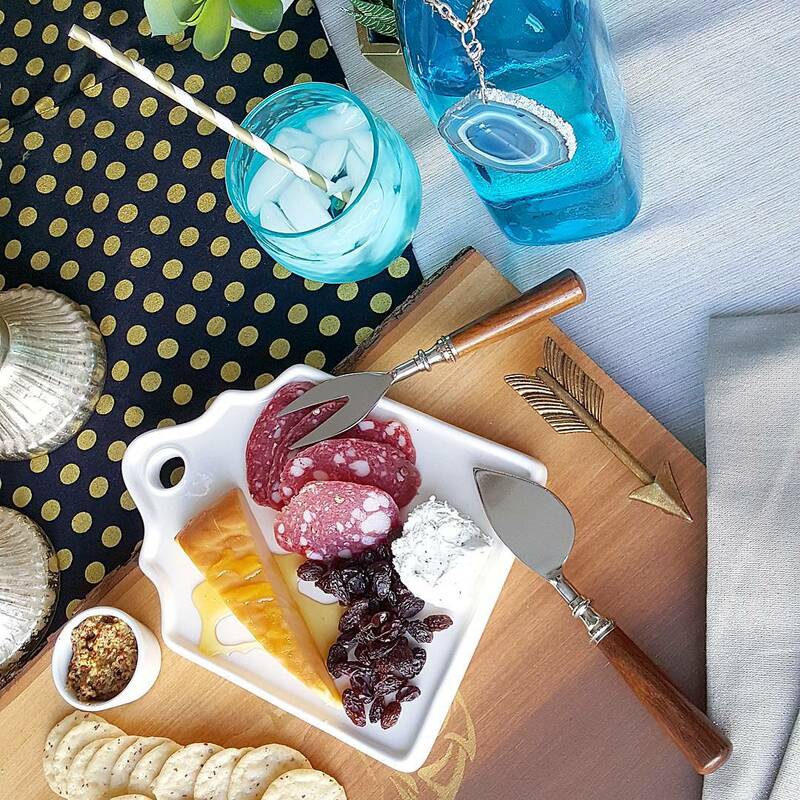 Luckily, most everyone I know likes entertaining so today I am sharing a foodie gift set that I created based around a wood tray and a glass water bottle. 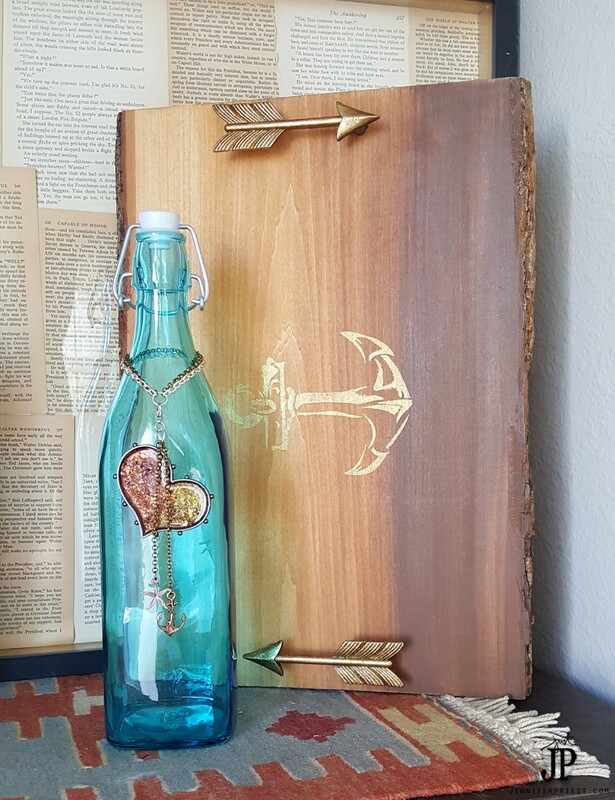 This post contains affiliate links and product provided by Walnut Hollow, DecoArt, Stencil1, ICE Resin, Cousin Corp, and Minwax – all opinions are 100% my own. I received an apple shaped cutting board as a gift from my friend Elena about 10 years ago and it is something I love to use at parties for serving cheese and other delicacies. My best servingware have been gifts and if they are handmade, even better because they become conversation pieces at parties. I created this gift set with that in mind. Shhhh, I think we're supposed to give it to my brother-in-law but I kind of want to keep it! Speaking of gifts for guys, I recently shared a gift guide for Millenials with lots of ideas of things you can buy (there's a hop and a giveaway for that too: Millenial Gift Guide). 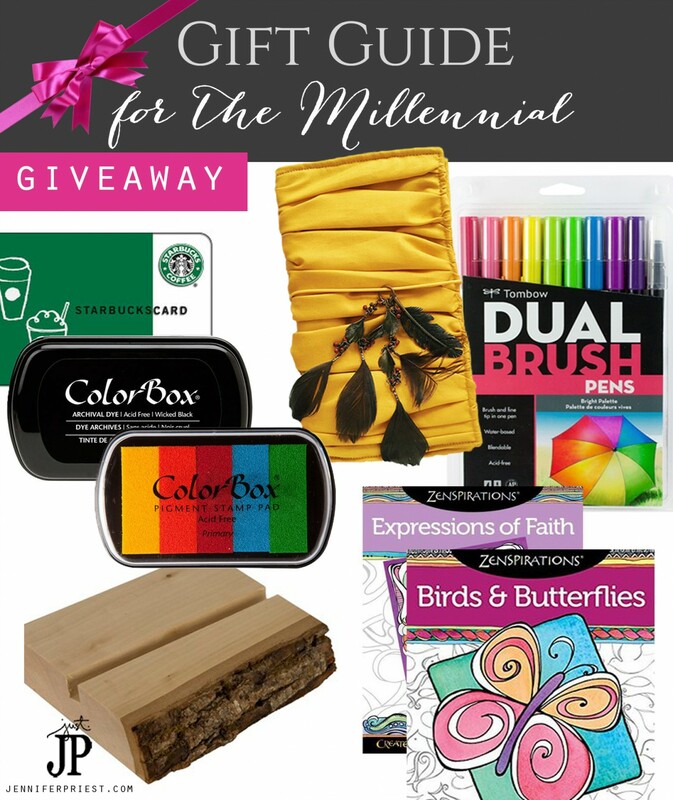 Be sure to check out the giveaway, especially if you like crafts because it has goodies from some of the Handmade Holidays sponsors like Walnut Hollow, Clearsnap, and Tombow USA. 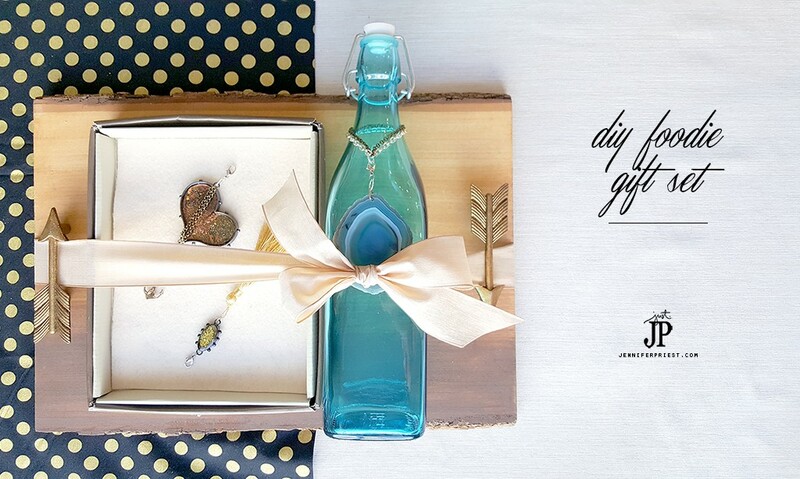 This gift set is actually pretty easy to make and it looks like it cost mega bucks (but it totally didn't!). 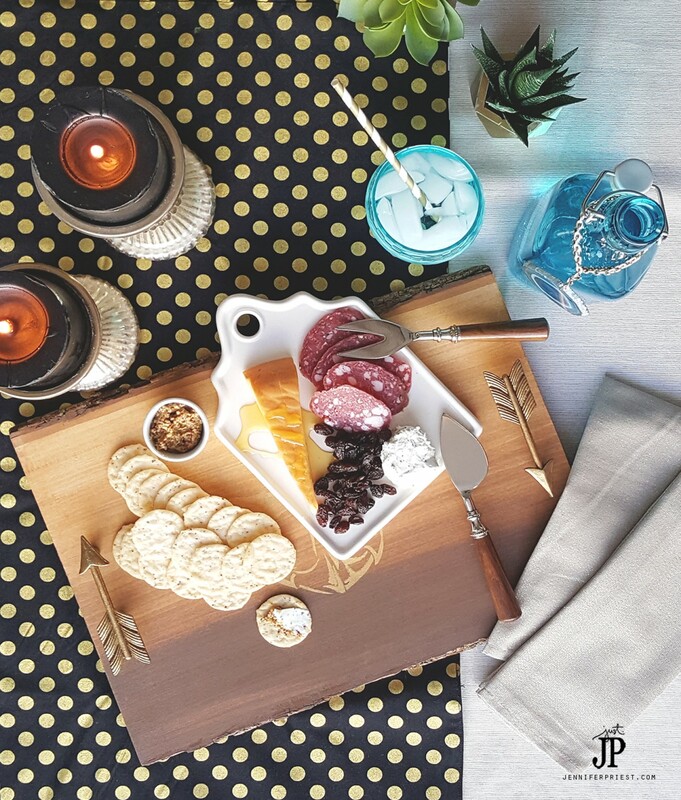 We created a wood cheese tray or serving tray that can be paired with your favorite foods to make a fabulous DIY foodie gift set: jars of spice mixes, favorite tea, honeycomb, fancy cured meats, and a set of cheese knives. I've been seeing capped water bottles at trendy restaurants for a couple years and now you can get them at Target. I created several interchangeable bottle charms to adorn the water bottle. But who wants to have the same glass water bottle as everyone else? These can be clipped on and off and also used on wine or any other bottle with a narrow neck. Crate a different one for various occasions. I created these bottle charm with 3 interchangeable attachments: an agate slice, and ICE Resin bezel with tassel, and an ICE Resin bezel with two charms. Stain the wood plank using wood stain. 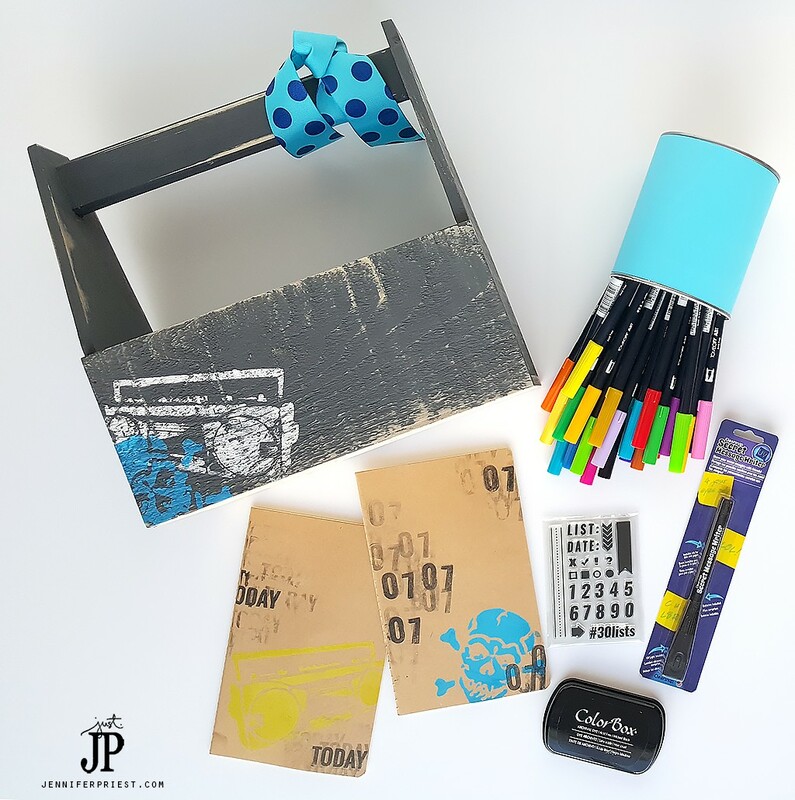 Attach a stencil to the center of the wood plank with washi tape or masking tape. Apply gold paint through the stencil and allow to dry. Spray the plank with a clear sealer. Mark the holes for the handles on each side of the plank. Drill the holes for the handles. Attach the handles to the plank, countersinking the nuts on the back. Use a hacksaw or rotary tool to cut the ends of the bolts flush with the back of the plank. Sand the ends of the bolts smooth. Cut a length of chain about 1/2″ shorter than the diameter of the bottle. Attach the chain together at the ends with a jump ring. Check that the chain can slip on and off the top of the bottle. Create bezels using ICE Resin, glitter, and shattered inclusions to use as charms. Attach charms and chains together to make tassels. Attach these to a lobster style clasp with a jump ring. Holiday parties are a great place to give a gift like this, especially for a hostess. To wrap this gift, thread a wide ribbon through the handles of the tray. 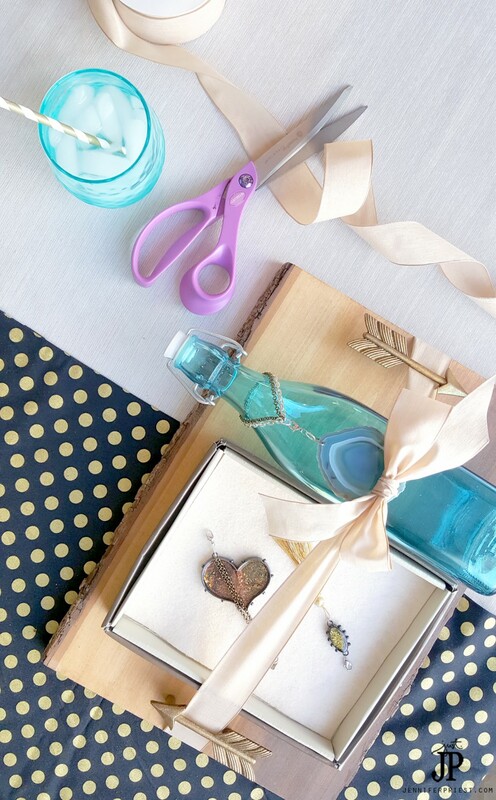 Place the items on the tray and tie the ribbon around them. Place the additional bottle charms in a box lined with felt. Add a small basket with cured salami, cheese, fancy mustard, and other accoutrement. Continue on the hop by clicking the next link in the list below. 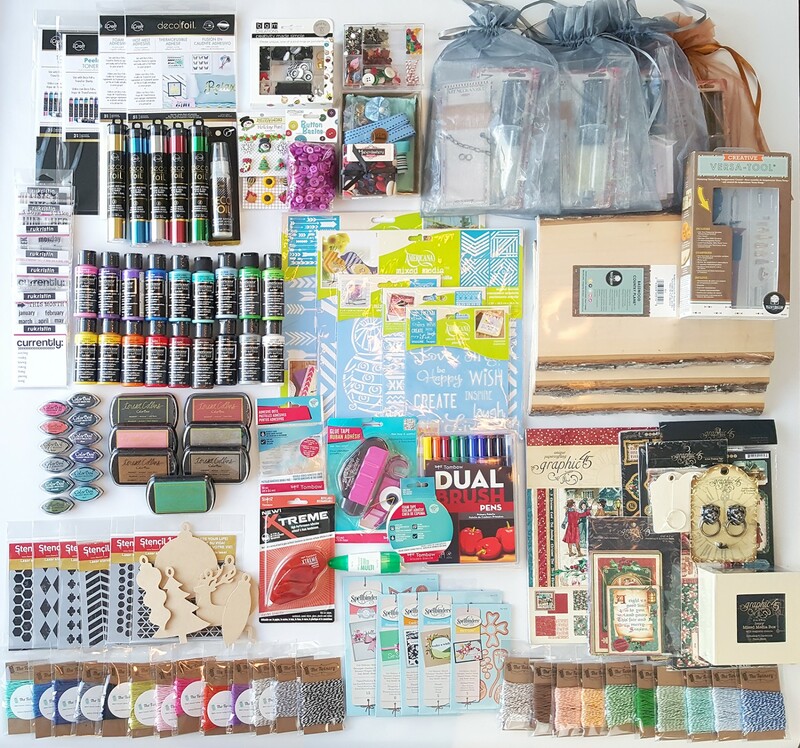 Be sure to visit all of the blogs so you can enter our amazing giveaway of over $600 in craft supplies from all the sponsors. Love the bottle charms! Thanks for sharing and all the inspiration during the Hop! I’ve only been joining in on this hop since last year, but I’m so honored to be a part of it Jennifer! You’re so great at organizing everything and your projects are amazing! Oh thank you so much 🙂 You’re amazing too! You have to be the busiest person on the planet! Everything you touch becomes more beautiful. Love the bottle and that tray is absolutely spectacular!! I think I would have a hard time parting with it too!!! TFS! These projects can be done anytime of year + with modification)! I have a few people who would love this tray on my list!!! Thanks for all the great ideas shared!! Very cool, thanks for sharing, love it!! FABULOUS gift ideas Jennifer, PRETTY and PRACTICAL!!! 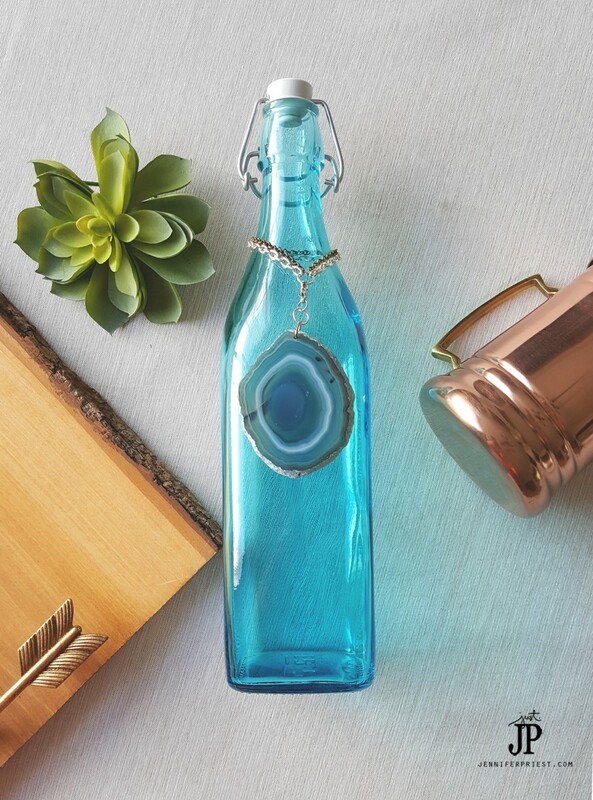 LOVE the idea of the bottle and charms!!! Love the creative way you’ve presented the cutting board! Love the project, thanks for sharing this would be a great gift. Thanks for the wonderful gift idea. I always have trouble wrapping gifts, but the way you did it is a great way to save on paper and frustration! gorgeous set! a really neat gift! I love it! I just adore that tray. Those arrow handles are so cool. Never saw that before. Great Job!